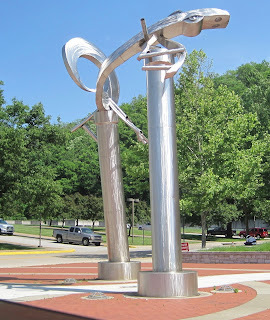 NEXUS,and its sister sculpture, 'Now Get', sits in front of the Kentucky Transportation Cabinet Building at the convergence of Holmes, High, and Mero Streets. Sculptors Erika Streker and Tony Higdon describe the 50-foot tall Nexus as an amalgamation of themes relating to transportation, including a bridge form, the wing of an airplane, and a boat form. 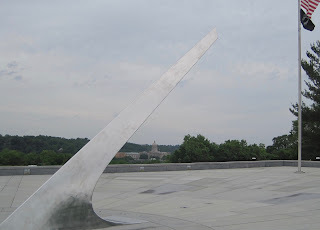 The sculptors, who created the sculpture horizontally and then installed it vertically, explained that the title of the piece means a convergence or coming together. NOW GET,the public art piece is also in front of the Kentucky Transportation Cabinet Building. 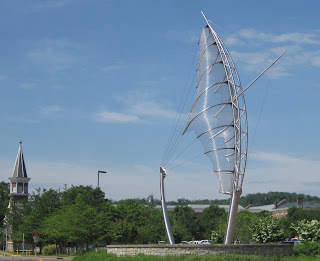 According to theFrankfort Public Art Tour, sculptor Garry Bibbs created the sculpture to get people’s attention through the dynamic movement inherent in the twin, towering arch passageway design. He also wanted to tell a story of transportation. Forum, government, and order are represented by the columns, and the looping bridge forms connecting the columns represent travel, both in time and in space. The piece culminates with an abstract flying automobile at the top. Bibbs chose the title 'Now Get', which is Southern slang meaning ‘get out of here and get out of here quickly.’ He used this expression because he wanted to draw people in to make their own interpretations. ABRAHAM LINCOLN statue, standing 14-feet tall in the center of the Capitol rotunda, is one of the most impressive artistic renditions of a former United States President. The U.S. President during the Civil War, this 16thPresident was born in Hodgenville, Kentucky in 1809. 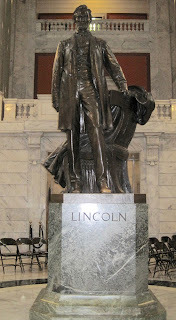 Lincoln stands beneath an imposing dome that towers 190-feet above him. He is surrounded by statues of four other famous Kentuckians: Jefferson Davis Henry Clay, Alben Barkley, and Dr. Ephraim McDowell. KENTUCKY VIETNAM VETERANS MEMORIAL,overlooking the State Capitol Building, is one of the largest granite memorials in the nation and contains 327 cut stone panels weighing more than 215 tons. Officially dedicated on November 12, 1988, this moving memorial honors the 125,000 Kentuckians who served this nation so courageously and unselfishly during the Vietnam era (1962-1975). The blue-gray granite plaza of the Memorial contains the names of Kentucky’s 1105 citizens who died. Each name is precisely located so the shadow of the 14-foot high sundial pointer, or gnomon (pronounced ‘noman’), touches, and darkens, each veteran’s name on the anniversary of his death. Thus, each individual is honored with a personal tribute. 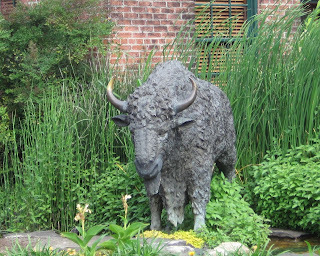 BRONZE BUFFALO,a life-size sculpture standing guard in front of the Visitor Center at the Buffalo Trace Distillery, pays homage to the millions of buffalo that once lived in Kentucky. The distillery sits along the great Buffalo Trace, a great trail that migrating buffalo and early pioneers once trod on their journey through Kentucky. While few buffalo survive to this day, the rugged independence and spirit of adventure they embody can be found in the American people today. JOSEPHINE SCULPTURE PARK is an outdoor venue dedicated to the arts. It has over 40 sculptures and murals placed through the park along mowed paths bordered by Kentucky wildflowers. The sculptures were created by artists from all over the US. A self-guided walking tour (cars cannot drive through it) allows you to wander through the 20 acres and enjoy this outdoor art gallery. 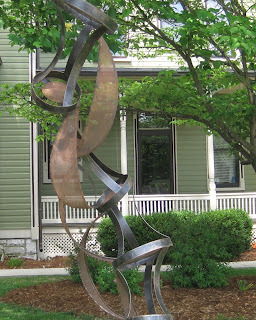 If you are unwilling, or unable, to walk the park, you can see a sample of the park’s art in front of the Frankfort Visitor Center located in the Queen Anne-style Gooch House.